This swingset is no longer available, but we have plenty of other swingset kits to choose from. Your Gorilla playset will arrive pre-cut, pre-drilled, pre-sanded and ready to assemble. The Blue Ridge Overlook will ship to you in boxes via truckline with curbside service. You may need to assist the driver with the unload and inspect the shipment for any damages or shortages. *There may be an additional charge to remote areas or for special services. Gorilla incorporates solid framing and all bolt construction; heavy-duty swing belts, components, and slides. All of which provide maximum stability, longevity, safety, and make the Gorilla brand swing set the heaviest duty and best-valued pre-milled swing set kit in the marketplace. 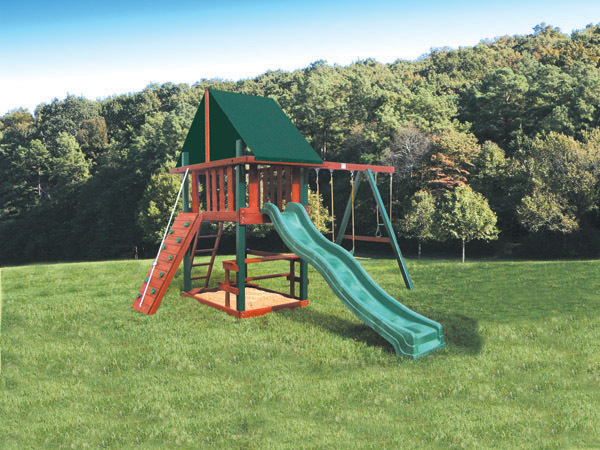 These wooden swing sets include all pre-cut, pre-sanded, and pre-drilled lumber as well as all required hardware, swing set accessories, slide, and detailed instructions required to assemble the swingsets. Our Swing sets are designed with a child’s safety in mind yet they still provide a challenging and fun recreational setting.